Saturday's 27-17 win over Rutgers was a bit of a strange game. 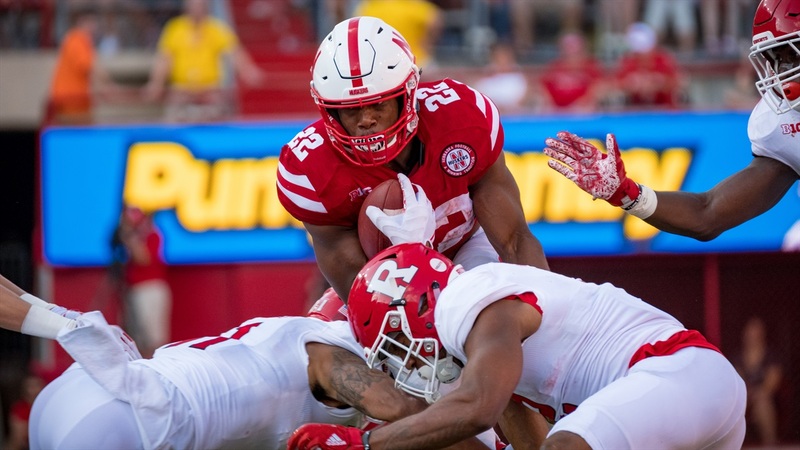 Nebraska certainly showed progress from the previous week, but with the number of starters out of commission and the level of competition (Rutgers is really, really bad), drawing too many conclusions is probably unwise. 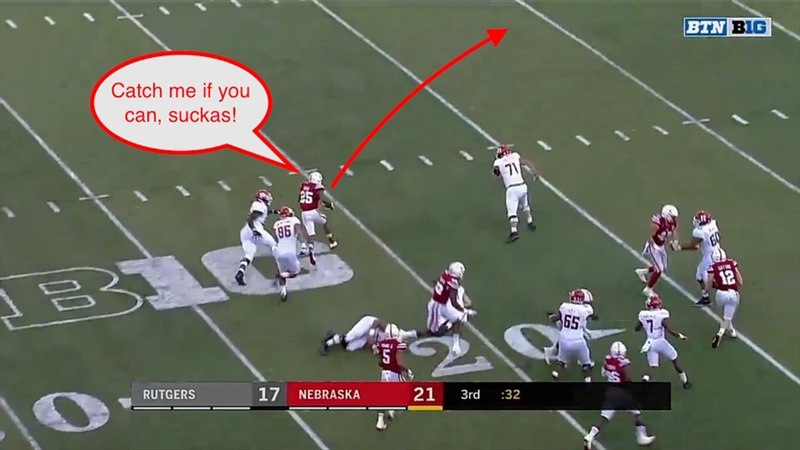 With that being the case, I decided to do a grab-bag post this week breaking down some of the top plays from the game on both sides of the ball. Without further ado, let's dive in. 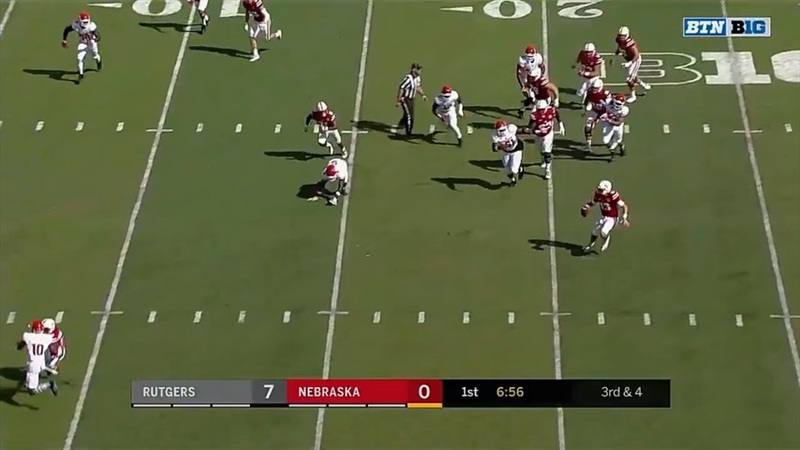 Nebraska marched right down the field on its first drive of the game, much like it did against Northern Illinois the previous week, but this time the Huskers finished it off. 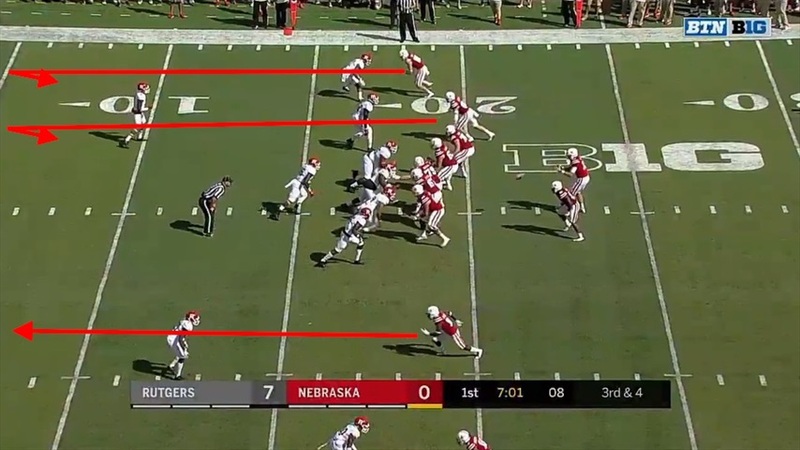 On third and 4 from the 18-yard line, Nebraska lined up with three receivers and a tight end, two on each side of the formation. 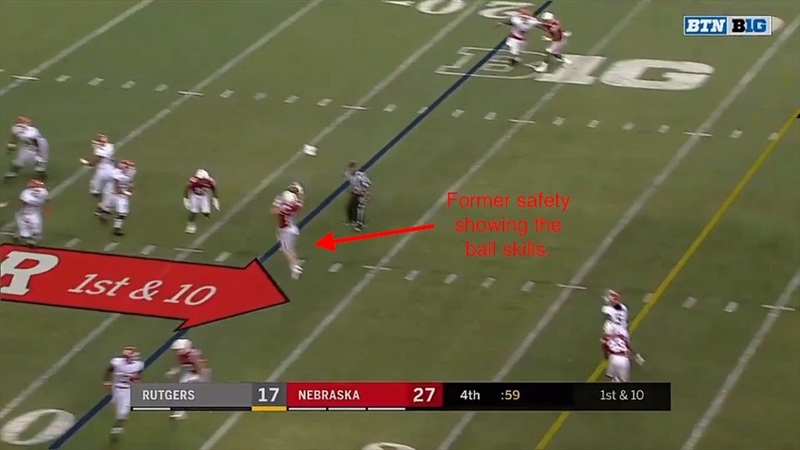 The two players to the boundary side both ran 15-yard comeback routes, while Spielman in the slot ran up the seam into the end zone. 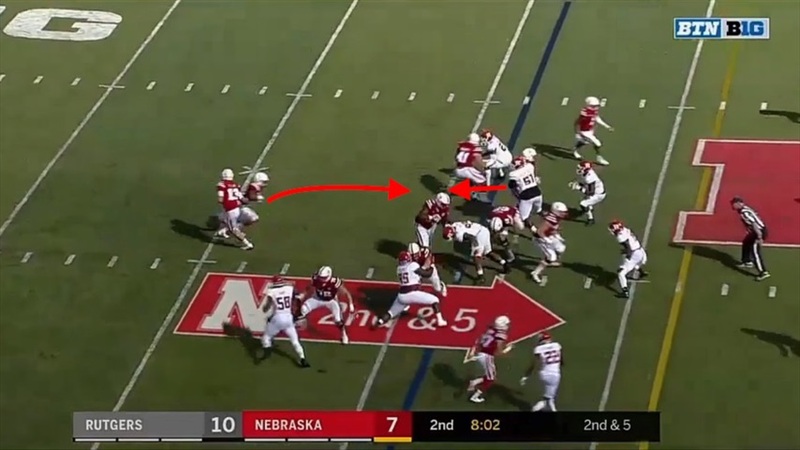 Quarterback Tanner Lee gets plenty of protection with a huge pocket, but both players to the boundary side – Lee's first read – are covered. Knowing the line wouldn't be able to hold up forever and seeing plenty of open turf, Lee rolls out to his left. He could have kept running and probably picked up the first down, but Lee keeps his eyes down the field and pulls up before crossing the line of scrimmage. 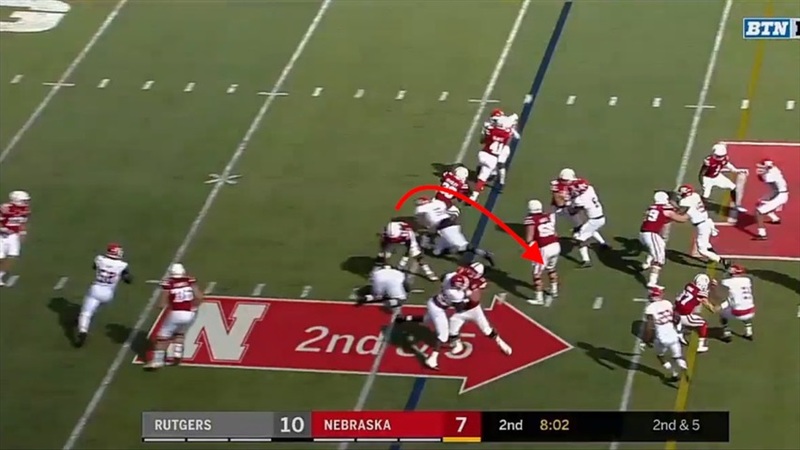 Spielman gets deep on his defender and creates a bit of separation, but Lee is already on the move and it woud have been tough to make the throw over the top here. 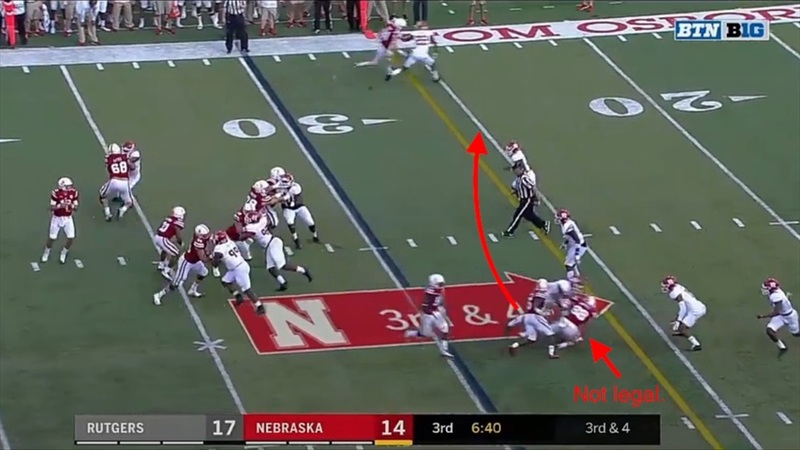 Spielman reads the situation and reacts, breaking off his route to the corner as Lee looks to the field side. Lee puts the throw on the money and Spielman hauls it in for his first career touchdown catch. "That's what we practice – scramble drill, stay alive, stay in-tune with the quarterback and he did it just right," wide receivers coach Keith Williams said. The redshirt freshman slot-back led the Huskers with five catches for 46 yards including the 18-yard touchdown grab. 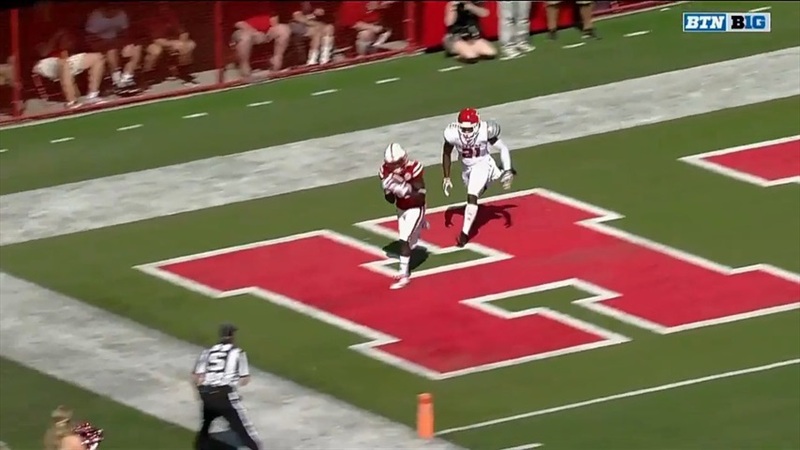 With Lee's favorite target Stanley Morgan Jr. on the shelf and only two other original scholarship wide receivers available, Nebraska needed Spielman to step up and he did just that. 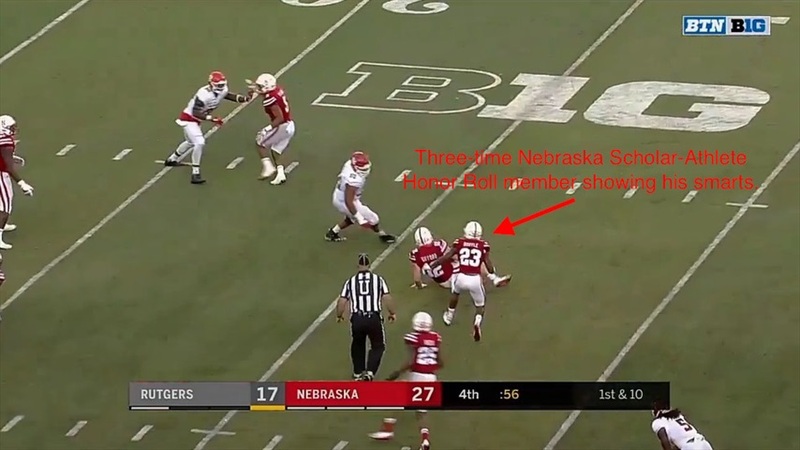 Nebraska's true freshman tailback saw his most extensive action of the season on Saturday as he carried the ball six times for 16 yards. On his first career carry, Bradley got buried 1 yard past the line of scrimmage (he never had a chance). The freshman got another carry in the second quarter, and this time he got a chance to do something with it. 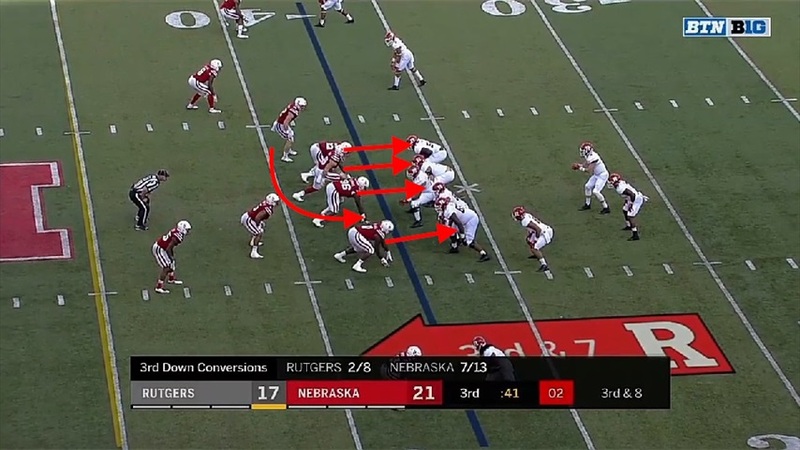 On second and 5, Nebraska lines up with fullback Luke McNitt in the backfield with Bradley. The play is desgined to go between the tackles. 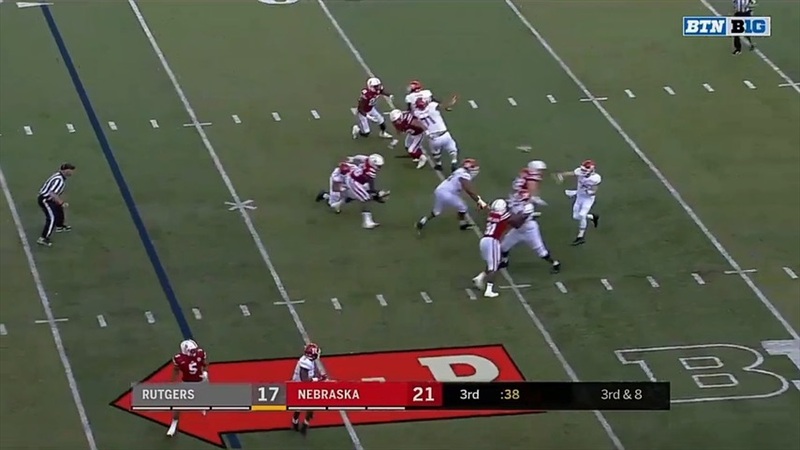 As Lee hands off to Bradley, Nebraska sets up its blocks pretty well and a hole seems to be forming. 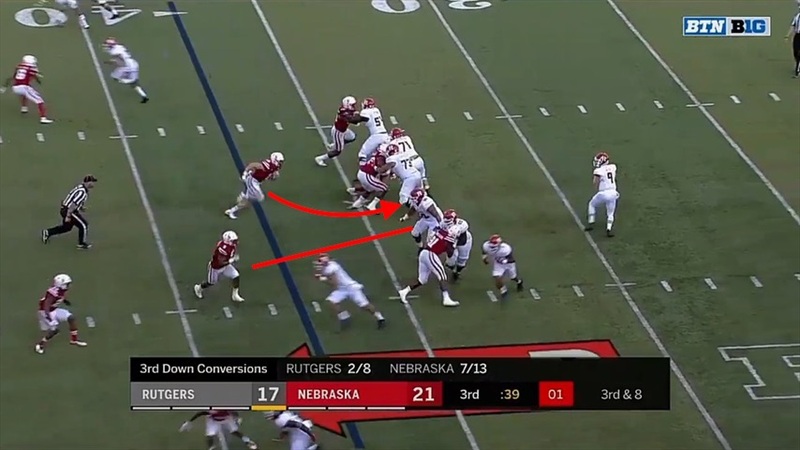 However, tight end Connor Ketter seemingly chips Rutgers' nose tackle (which barely affects him) then looks to throw a block at the next level. The nose has a clear shot at Bradley, but the shifty back cuts outside to avoid him turns it back inside. A second defender takes a shot at Bradley before the line to gain, but Bradley side-steps him just like he did to the nose, running through contact to pick up the first. Bradley finally gets taken down from behind but not before he picked up twice the yardage he needed to reset the chains. 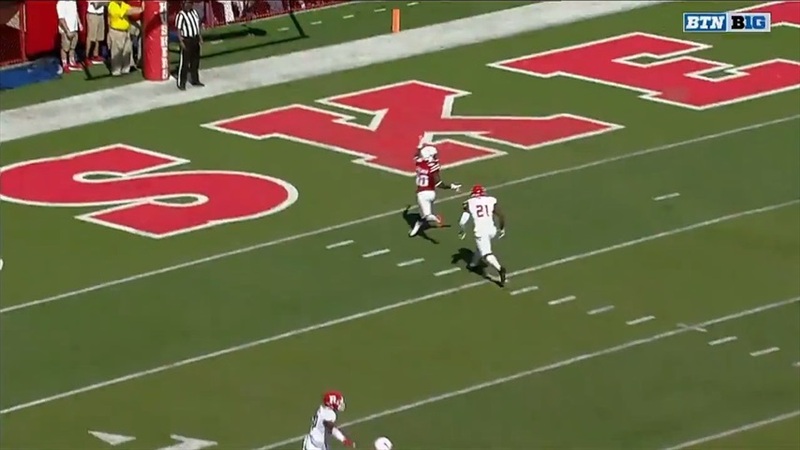 This play accounted for half of Bradley's yardage on the day, but it gives a glipmse of the freshman's talent. Two defenders had him dead to rights yet he turned it into a nice gain. Bradley's ability to make cuts at full speed and run through contact will serve him well as his career in Lincoln plays out. 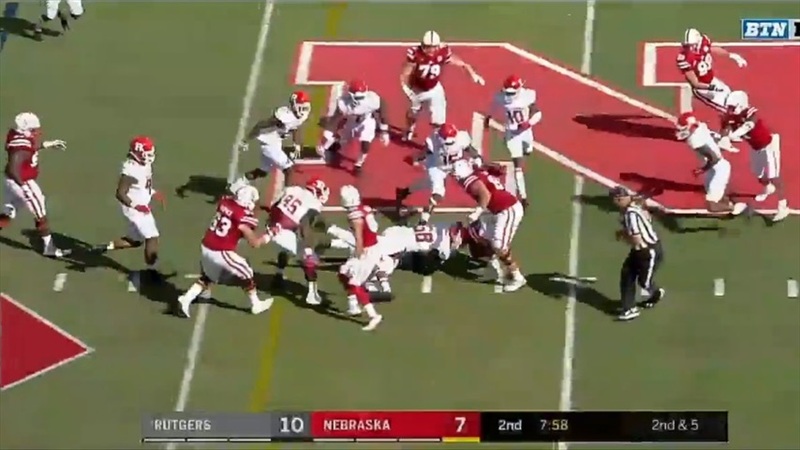 Nebraska faced five third downs during its 17-play go-ahead third quarter drive that started at its own 3 and converted on each of them, whether on its own or with some help from the defense. On this play, a little of both resulted in a fresh set of downs. 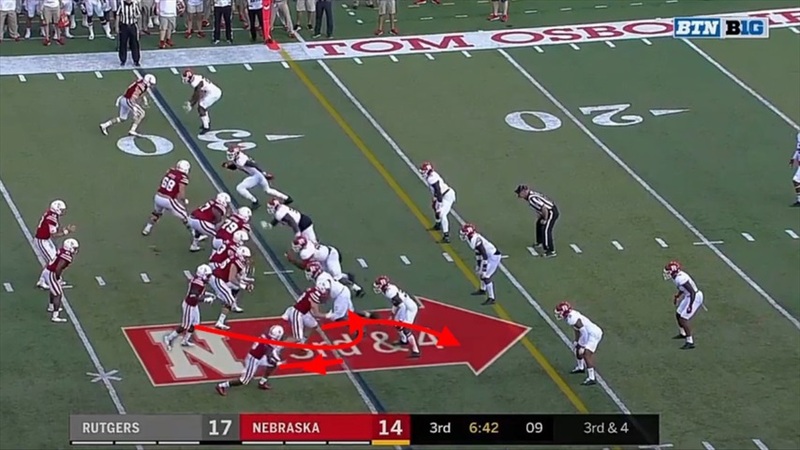 On third and 4, Nebraska lined up with a bunch to the right of the tackle box. Tight end Tyler Hoppes was up on the line with Spielman and Pierson-El behind him. Hoppes is going to try to turn it outside, Pierson-El will go over the middle and Spielman will sit down in the flat. 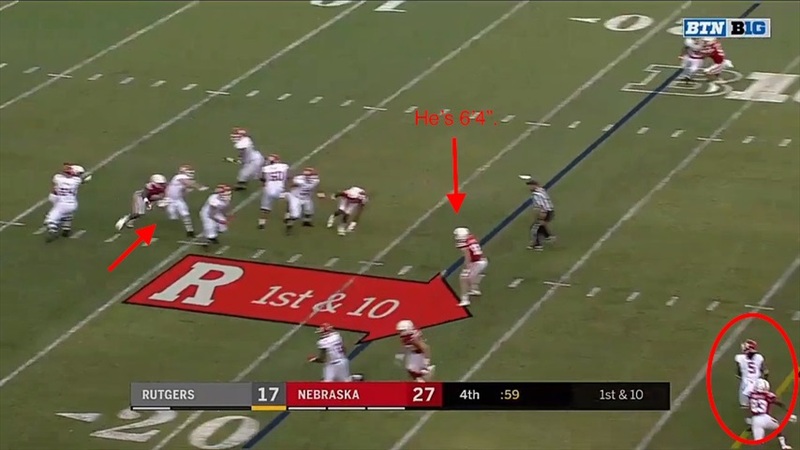 However, Hoppes doesn't get far as he's pulled to the ground right after he crosses the line of scrimmage. Pierson-El bumps into the pile, hesitates for a brief second then cuts underneath across the middle. 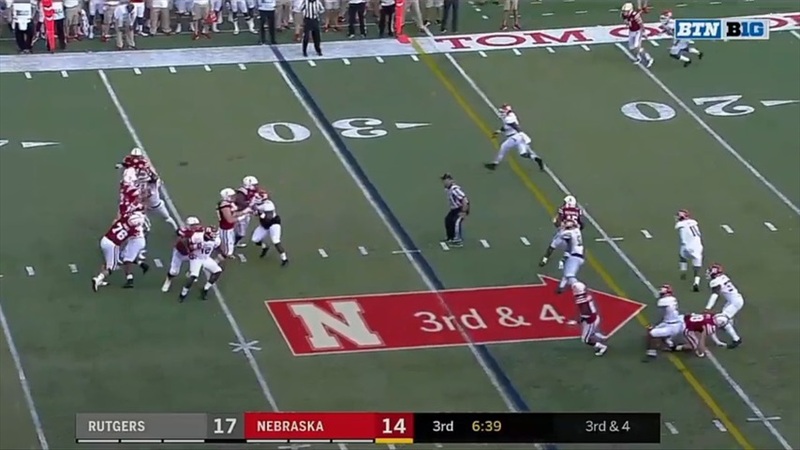 The linebacker is slow to react and Pierson-El turns up the field with some separation. Lee sees him and delivers the throw on time and on target. 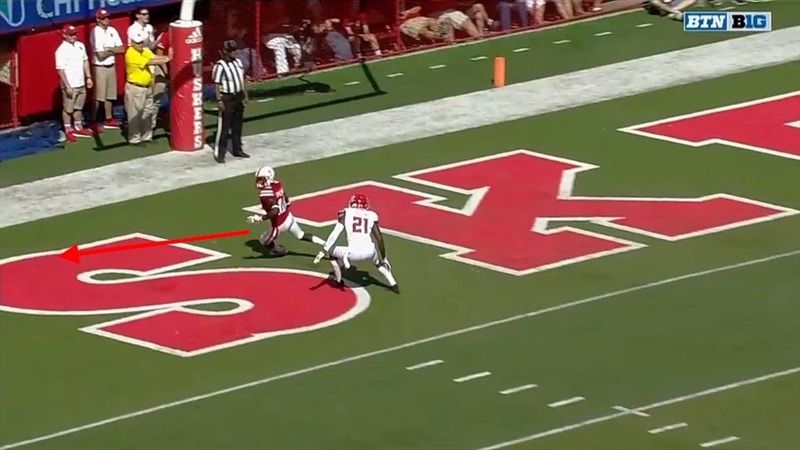 Pierson-El catches the ball and easily picks up the first down before getting tackled from behind. 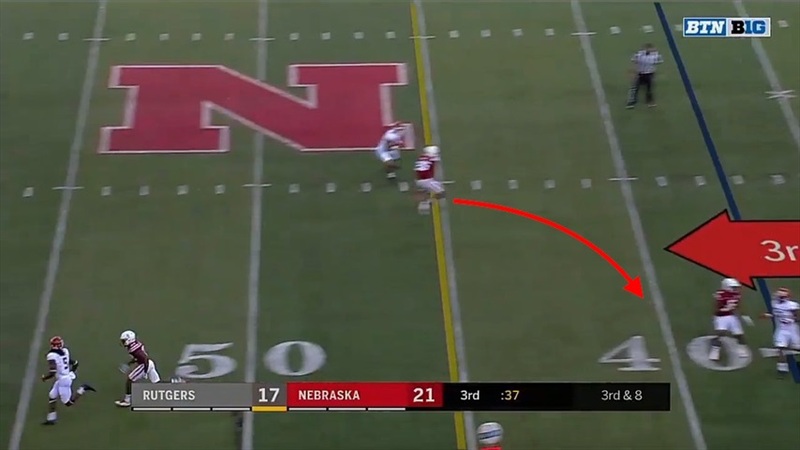 The play would have resulted in a conversion regardless because of the hold against Hoppes, but Pierson-El took advantage of the confusion of the play to gain twice the yardage the flag would have given them. Let's wrap this up with a couple of defensive plays, shall we? This play was huge and should have been even bigger. 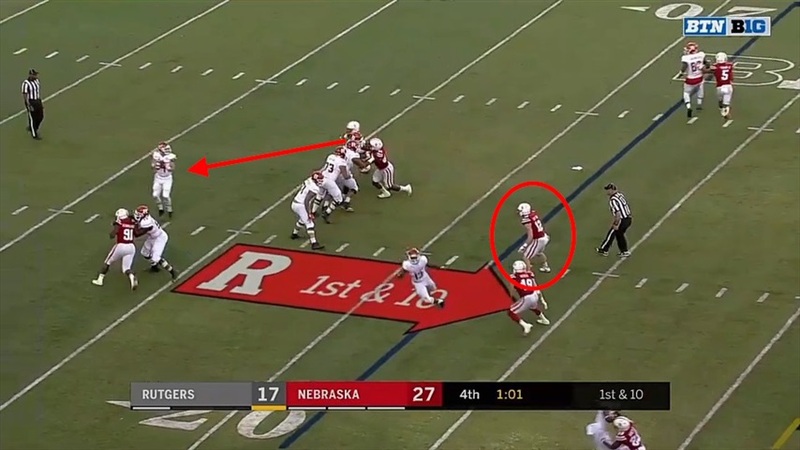 Leading 21-17 late in the third quarter, Nebraska forced Rutgers into a third and 8. 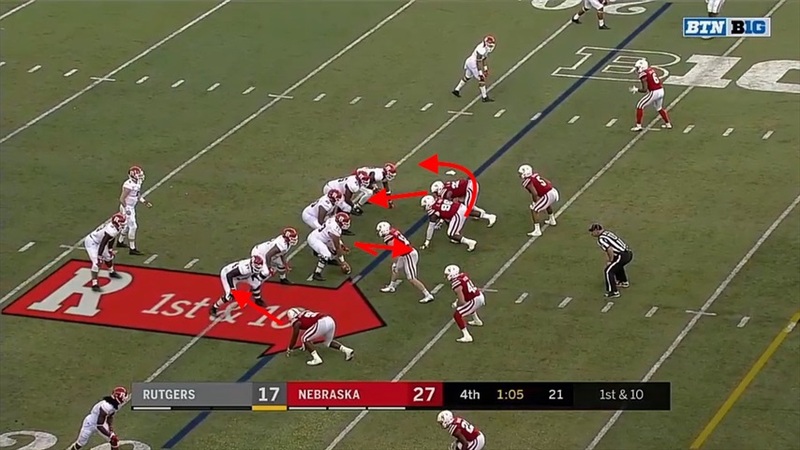 Defensive coordinator Bob Diaco drew up some pressure, stunting lineback Luke Gifford in behind the three defenders rushing head-up on the center, right guard and right tackle. Freedom Akinmoladun rushes from the other side, leaving the left guard as the only free offensive lineman. The guard sees Dedrick Young II near the line, a potential threat. 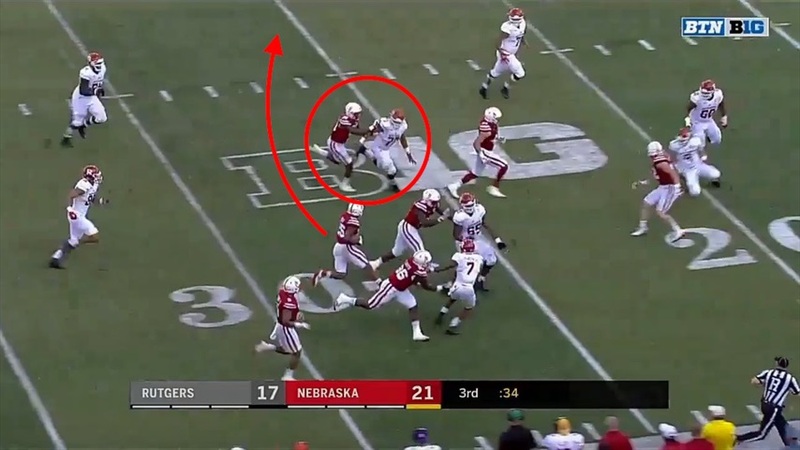 However, Young hangs back while Gifford loops in from the opposite side to run right up the middle (if we're being critical here, looping is the key word; he needs to straighten out his rush lane and brush right off the back side of the inside block to allow him to get to the quarterback as quickly as possible). The guard is too slow to recover and cut off Gifford as the linebacker runs up on the quarterback who is trying to throw the ball. The pass is way off-target and hits Antonio Reed right between the numbers (a good things since he only has one functioning hand). Reed catches the ball and is off to the races. Reed makes his way up the right sideline with an entourage, then cuts it back towards the middle of the field. However, Alex Davis is called for a block in the back here. 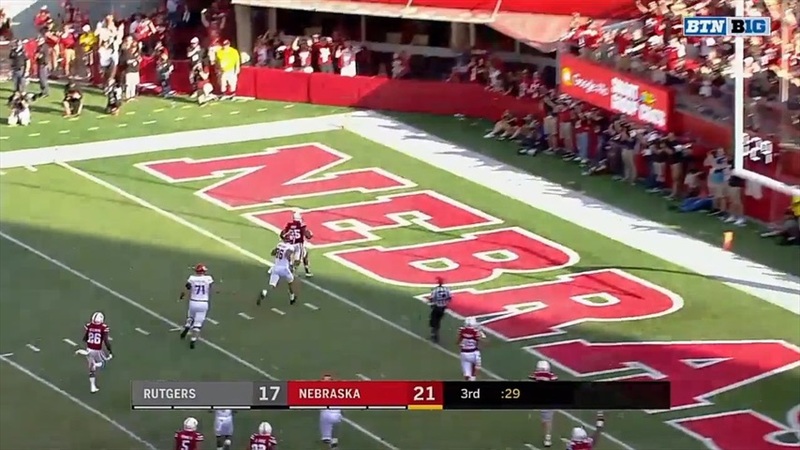 Illegal block aside, Reed crosses the 20 with nothing but turf in front of him. Reed croess the goal line and for a moment the fans get to celebrate a pick-six of their own after seeing three of them going the other way already this season. 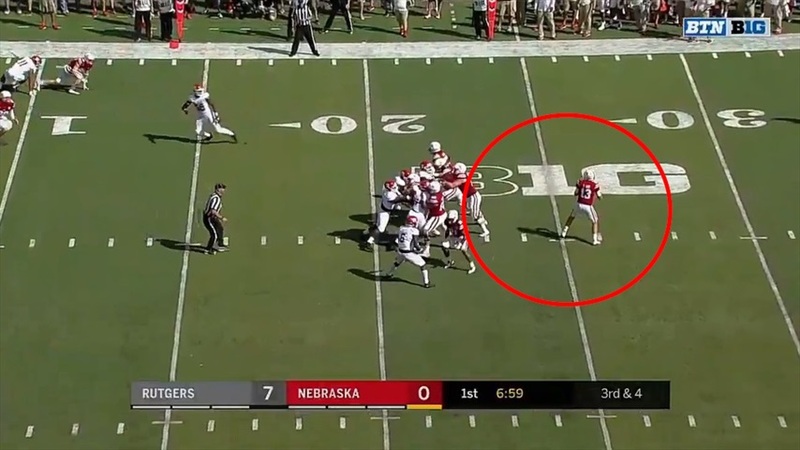 While the run-back was nice it was completely irrelevant as Nebraska had already gotten busted for a block in the back even before Alex Davis' as Eric Lee Jr. (who never appears on the screen) was the culprit. "We had two penalties on the play," Coach Mike Riley said. "And those guys aren’t as used to blocking in those situations, so all of a sudden rules click in where you can’t block below the waist or you obviously can’t block in the back, so we hurt ourselves in that way. Still, it was a great play call by Diaco and a great catch and return by Reed. 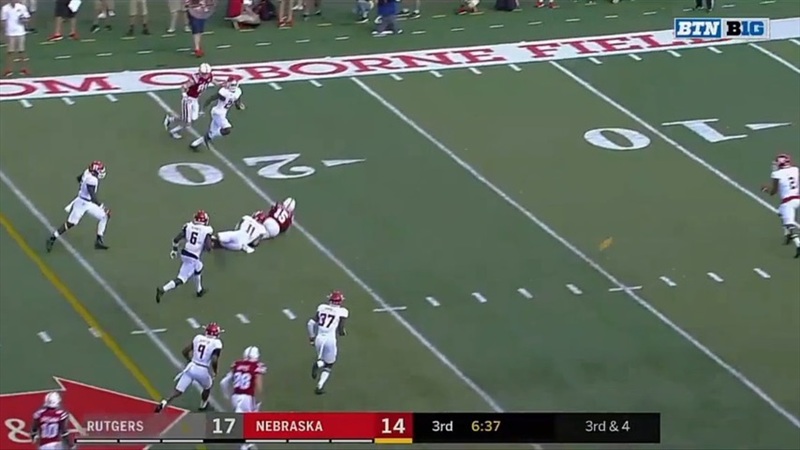 Diaco had some fun with this play. This is a formation that I'm not sure I'd seen before. Carlos Davis and Akinmoladun lined up next to each other outside the left tackle while Alex Davis has his hand in the dirt on the other side outside the right tackle. Luke Gifford stands up right in the middle of the line, showing blitz. 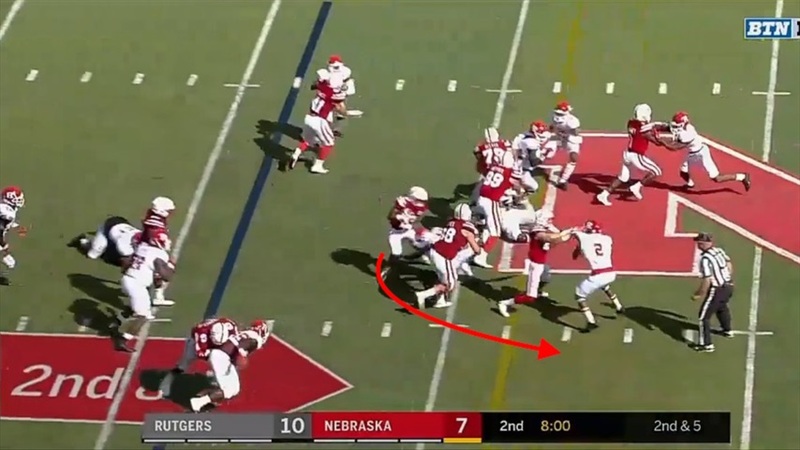 What happens here is the tight end outside the tackle runs a route, Akinmoladun rushes the tackle, Carlos Davis stunts around the outside, Alex Davis rushes from the left and Gifford fakes a blitz then drops back into a zone. Davis shows some serious speed turning the corner and has a free lane to the quarterback. Gifford is hanging out near the line of scrimmage as a spy. The quarterback releases the ball as Davis gets to him and makes contact. It looks like No. 5 was the target, and he did look open at the sticks with Dicaprio Bootle trailing him. However, Luke Gifford is tall. Gifford leaps and snatches the ball out of the air, showing off some nice ball skills. He takes off running, but understands the time and situation and hits the turf. "I actually didn't know it was a pick until after," Carlos Davis said. "Just being able to disrupt that and Luke get the pick, that was a great way to end the game. I love it." 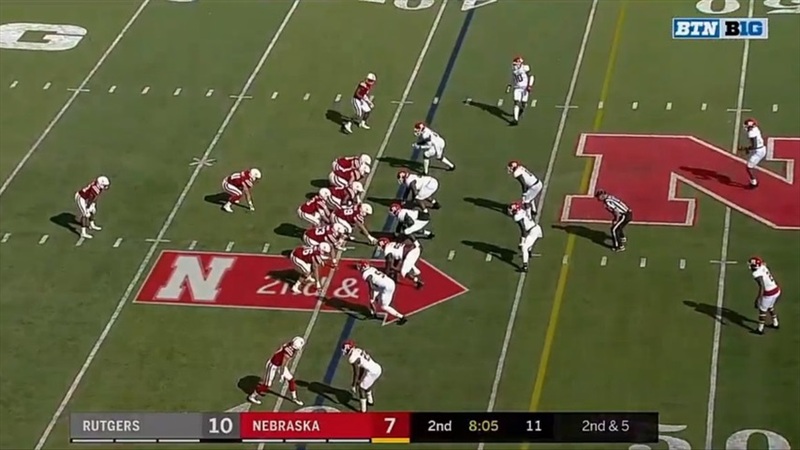 Nebraska lines up in victory formation twice and the clock runs out. Game over. "It’s fun to see Luke Gifford, although he might have liked to score a touchdown at the end, to take a knee and just finish the game out after his interception," Riley said. "It’s fun to see guys make smart choices in football. Kind of the opposite of what happened on the interception return."